GOG AND MAGOG HAVE BEEN RELEASED! How are they in control? There are many evidences that Gog and Magog are in control but we will show one evidence from CNN now. The other ones will be listed and explained briefly as we move on.. The Cable News Network (CNN) is an American basic cable and satellite television channel that is owned by the Turner Broadcasting System division of Time Warner. It was founded in 1980 by American media proprietor Ted Turner as a 24-hour cable news channel; however, by April 2016, a CNN executive officially described the channel as “no longer a TV news network” and instead as “a 24-hour global multiplatform network.” Upon its launch, CNN was the first television channel to provide 24-hour news coverage, and was the first all-news television channel in the United States. ROBERTS: So Dan Brown’s new book, “The Lost Symbol,” it’s all about Washington, D.C. and the freemasons and the part they play. And are they holding secrets? And what about the pyramid, and the capstone and the lost word — can you tell I read the book? CHETRY: It’s number two, right? But, you know, there are some famous freemasons in American history. People like George Washington, for example. But who are the current freemasons in power under the dome? We’ll find out coming right up. Thirty-seven minutes after the hour. CHETRY: Twenty minutes before the top of the hour. Welcome back to the Most News in the Morning. You know, the new bestselling thriller from “Da Vinci Code” author Dan Brown is set in the nation’s capital and it’s centered on the world’s oldest and largest fraternity. Dan Brown’s “The Lost Symbol” has renewed interest in the Freemasons. And as Elaine Quijano tells us, it’s a secret society that’s still well represented in the halls of Congress. ELAINE QUIJANO, CNN CORRESPONDENT: John and Kiran, for all the conspiracy theories about Freemasons, this much is true. They can still be found at the highest level of American government. QUIJANO (voice-over): From the Capitol to the White House, Freemasons throughout history have freely roamed the halls of power in Washington. Nine of the men who signed the Declaration of Independence were Freemasons as were more than a dozen U.S. presidents, including George Washington, who famously laid the cornerstone of the Capitol building clad in his ceremonial Masonic apron. ARTURO DEHOYAS, MASONIC HISTORIAN: We have a egalitarian ideas. We believe that people should rule themselves, that they should elect their own leaders, that they should be governed by constitutions, have separations of power. QUIJANO: Senator Chuck Grassley is a Mason. So is Senator Jon Tester. But getting someone to chat about it can sometimes be tricky. UNIDENTIFIED MALE: I’m doing health care. QUIJANO: Senator Mike Enzi didn’t break stride while explaining why he’s part of the secretive society. SENATOR MIKE ENZI (R), WYOMING: It’s a brotherhood built on constructing good men. SEN. NICK RAHALL (D), WEST VIRGINIA: I became a Mason in my local lodge in Beckley, West Virginia. RAHALL: This was this 32nd Degree. QUIJANO: Congressman Nick Rahall, a Mason for almost four decades, decoded Masonry’s most prolific symbol. RAHALL: You may see the compass and the square as symbols of Masonic training. I would live by the square. We are upright individuals. QUIJANO: The congressman describes Masonry as a fraternity. He says his mentor and fellow Mason, West Virginia Senator Robert Byrd, nominated him for membership. As a 33rd Degree Mason, the highest level in the Scottish Rite of Freemasonry, Congressman Rahall acknowledges there are a lot of secrets and codes, but he says they’re not sinister. (on camera): So, are you trying to rule the world? RAHALL: Well, let’s say, no. But if we were, would I tell you? No. Did you read this part of the transcript? If you have read our 89th article you will realize that these guys (Gog and Magog) are just implementing the Dajjal’s ‘Declaration of the Rights of Man (1792)’. “The principle of all sovereignty resides essentially in the nation. 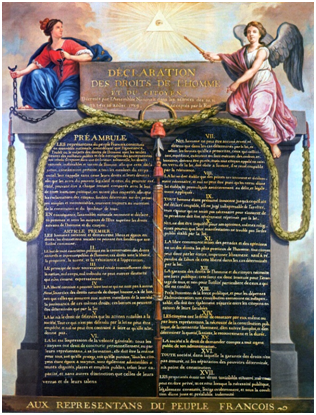 No body nor individual may exercise any authority which does not proceed directly from the nation.” (The Declaration of the Rights of Man, 1789). This was the model of the nation state that was adopted universally and is applicable in our current day. This conception of the modern nation state actually excludes God from exercising any form of sovereignty which is in absolute contradiction to Islam (and almost all other revealed religions) where Allah is presented as the source of all sovereignty. In the above four verses of the Quran, the foundations of law and their prescription lies in absolute terms with Allah. As revealed in the Quran, Allah is the One who prescribes the law through the Quran, this law being deemed straight by Allah, and it is He who then gives His law clarity for the believers to understand and apply in their lives. How can an assembly of men in the form of a parliament or any other legislative body elected by men, seek to overturn and seize this divine law giving process, deciding on what constitutes an offense and what does not? Moreover, the law prescribed by Allah in the Quran (or other revealed texts) is applicable for all times to come. Once a law is formulated and prescribed in the Quran, no level of expediency can alter it. On the other hand, modern democracy opens the very dangerous gates for expediency i.e. the law formulated by men is bound to undergo drastic shifts in its nature as and when it suits. It should be easy for the believer to discern the kufr of the dajjal (Horus) embedded in the very ideals of modern democracy which incidentally derive from the Declaration with the Ka Fa Ra sign of Horus or the dajjal. This Declaration being a milestone document in the history of Humanism, which in the guise of giving more power to the people is actually fulfilling its motto of ‘man is a god to man’ (nauzubillah). This deception is the trademark of the dajjal; in fact the very name dajjal implies deception. Think about all those countries that are governed by democratic manmade constitutions. Do you really believe that all nations that gained independence from colonialism and adopted the system of being ruled by a manmade constitution ensuring democracy was a coincidence? Reflect on this? Most if not all countries before gaining independence had Masonic lodges in them to ensure the system of democratic manmade constitution is put in place. Some had them Masonic lodges even before world war 1 and world war 2 took place. It is very clear that the point of even colonizing these countries was to force them to follow at least a democratic manmade constitution as per the order of the Dajjal. Once the leader(s) of the country accepts to follow a democratic manmade constitution, a scenario is laid out on how to stage the independence. Will it be by bloodshed or by selecting a leader to act out the role of a hero in bringing independence? Remember these guys own Hollywood; so it is not an issue for them to create different scenarios for different countries with the same outcome of following a democratic manmade constitution. Citizens of nations that seemingly got independence are happy to be free without realizing that they are still colonized by the Freemasons (Gog and Magog) since they are now following their shirk which is following democratic manmade constitutions . Countries were colonized in order to force them to rule themselves via manmade constitutions. Don’t be deceived if some countries that follow manmade constitutions are righteous, for example if they don’t allow Homosexuality. Shirk is Shirk. The most dangerous characteristic of Gog and Magog is Shirk which also means no matter what man made human constitution even if it doesn’t support homosexuality is shirk. Democracy is shirk! Even before Adam was created; the system of Khalifa is what Allah chose for us. Once while Allah’s Messenger (SAW) was reciting this Verse (Qur’an 9:31), ‘Adi bin Hatim said, “O Allah’s Messenger! They do not worship them (i.e. the rabbis and monks).” Allah’s Messenger (SAW) said: “They certainly do. [They (i.e. the rabbis and monks) made lawful things as unlawful and unlawful things as lawful, and they (i.e. Jews and Christians) followed them; and by doing so, they really worshipped them].” (Narrated by Ahmad, At-Tirmidhi, and Ibn Jarir). Do you see how people worship leaders nowadays? Different parliaments worldwide making their own laws in front of Allah; are they that brave or that reckless? In modern politics and history, a parliament is a legislative, elected body of government. Generally a modern parliament has three functions: representing the electorate, making laws, and overseeing the government (i.e., hearings, inquiries). America was founded by Freemasons as CNN stated above right? Do you really believe that they would let anyone else who is not Gog and Magog to become a president? 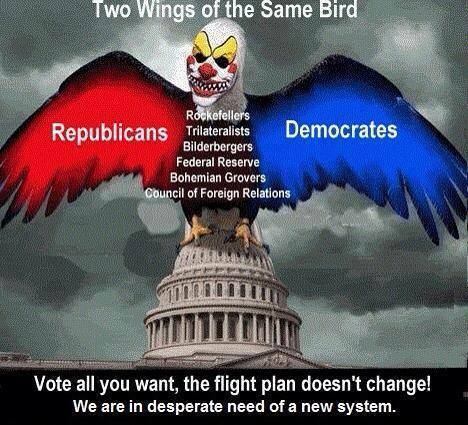 Do you really believe the two parties that are competing are working for the citizens or Gog and Magog’s agenda? This kind of deception is somewhat indicated in the Quran. Though the ones assisting Fir’aun are magicians, we can learn a lot about this scenario on how the Dajjal and his goons operate. The Dajjal and his top elite of Gog and Magog don’t really mind if other people are seen as the heroes. Just like Fir’aun was promoting the magicians to the public that the public should follow the magicians if they are the winners. Fir’aun understands that in the end he will still win as the public gets fooled. The magicians in fact are working for Fir’aun as can be seen in when they quote Fir’aun’s words in (Qur’an 20:63) from (Qur’an 20:57) in secret so that the public doesn’t hear them. Which means Fir’aun already gave them the view to act on. Why do the magicians still have to claim that they will win by the might of Fir’aun when Fir’aun himself ensured that the media of his time made the magicians the heroes to the point they should be followed if they win. This is from the plot he devised on (Qur’an 20:60); another proof Fir’aun talked with the magicians is when Musa gave them the go-ahead to begin they immediately threw their sticks to create illusions of snakes. How did they know this unless they heard it from Fir’aun himself who saw Musa’s staff turn into a snake and said he can produce similar magic. Fir’aun was their (false) god and they had to promote him. He did call himself god in many times as we can see from many Ayats from the Quran. He promoted himself as the god to be followed and the magicians he promoted, promoted Fir’aun as the god. Now how does this relate to the Dajjal and the leaders Gog and Magog? The Dajjal represents Fir’aun who are both in the end working for Satan (Iblis). The tops of Gog and Magog represent the Chiefs of Fir’aun when they have to listen to the Dajjal calling himself god while knowing that there is Satan (Iblis) the bigger boss who will live till the Day of Resurrection; the Chiefs of Fir’aun also believed that Fir’aun was a manifestation of Horus (an Egyptian false god who we believe is the Dajjal); previous Pharoahs also called themselves gods but the Horus they believed would continue. The magicians called on Fir’aun, but what do the politicians call on? They call on the democratic manmade constitution which is in fact the Dajjal because these are his laws as we saw above in the transcript of CNN and in the Dajjal’s ‘Declaration of the Rights of Man (1792)’. So despite which president enters into power after all the media attention and coverage; the call will always be to follow the democratic manmade constitution. The politicians/presidents will say speeches such as, “We will rule nicely with the democratic manmade constitution which the other party failed to use properly. Don’t follow the terrorists (Muslims) as they intend to take you away from your exemplary lifestyle. Remember when the two magicians (Musa and Harun) tried to remove the exemplary lifestyle of Fir’aun?” The last sentence was included in the speech to make us reflect and think. Instead of mentioning the Dajjal directly they mention him indirectly by mentioning his democratic manmade constitution system. Prophet Muhammad (SAW) told us that some of his features might be hidden from us. The Chiefs at Fir’aun’s time had to deal with Fir’aun as a god but the top members of Gog and Magog communicate with the Dajjal directly. From (Qur’an 26:44) they say that they will definitely win by Fir’aun’s might meaning they had no doubt that they would win. Satan [Iblis] also said in (Qur’an 38:82) that by Allah’s Might, he will surely mislead us all except the chosen slaves. The fact the magician’s lost to the point they had no choice but to prostrate truly shows that all their hopes of winning were crushed. What we witnessed here is them losing to Islam. Now that we know what Najwa is; let us reflect on (Qur’an 20:62). We see that the magicians had to conceal their Najwa (secret counsel). They probably didn’t want the public to know that the speech of Musa in (Qur’an 20:61) rattled some/most of them. Who were in the secret discussion circle in (Qur’an 20:62-64). Was it just the magicians? We will find out. We believe it was only the magicians having the discussion amongst themselves in (Qur’an 20:62-64) because if we look at (Qur’an 20:62) they were debating/disputing amongst themselves. If Fir’aun was present, would they dare to dispute in such a manner? Would they dispute with Fir’aun? Of course not, at this point Fir’aun was their god and hence they would never dare to dispute in such a manner in front of the so-called god who promised them wealth and high positions. Furthermore it seems they were disputing about their ‘amra/command’ which is most likely from Fir’aun himself. We notice that in (Qur’an 20:63) the magicians conclude that Musa and Harun are two magicians that intend to drive them out of their land with magic, and do way with their exemplary life. This is one group of magicians telling the other group of magicians to comfort themselves and the other magicians of this opinion. This opinion was most likely given to them by Fir’aun since he said similar words in (Qur’an 20:57). We notice that when Musa and Harun went to talk with Fir’aun, Fir’aun never really mentioned Harun by name and treated him like a nobody. He only mentioned Musa by name and never mentioned Harun by name indicating that he really looked down on Harun. But as we will see later when the magicians were defeated they (Fir’aun, Chiefs and Magicians) actually knew the names of Musa and Harun and said them when prostrating to Allah. Who told them the names, most likely Fir’aun since he had claimed in (Qur’an 7:127) that he has irresistible power over his people meaning he could gather information. Furthermore before sending of Musa and Harun his chiefs as shown in (Qur’an 7:111) already knew Harun was the brother of Musa. Now in (Qur’an 20:64) we get one sentence issued to the magicians. But who made this sentence that they should combine their plots and assemble in line and that the one who wins amongst them will indeed be successful. [‘Isteila’ – the one who comes on top. So, who is gonna come on top? The one who impresses the people.] If they were one group they would have to refer to themselves as well but since one or many are telling their fellow magicians to combine and assemble themselves in line somehow indicates that there is more than one group and they have to work together. Does this mean that the magicians were not working as one body from the start? Were there many groups of magicians with each group having a leader and that in the past they used to compete against each other in the day of the festival that Musa mentioned in (Qur’an 20:59)? The fact that the Chiefs recommended that the best sorcerers be brought shows that they made them compete against each other and if Musa was doing magic why not make pit Musa against the best Magicians to see who is the best as Fir’aun suggested in (Qur’an 20:57-58). This is further proved because the magicians came from different cities meaning each city had its own leader and they now had to work together to defeat Musa. In previous festivals it was probably these best magicians that were determined the best after the showdown with the other not so great but amateur magicians. Another proof that there were different camps of magicians can be seen in (Qur’an 7:119-122), (Qur’an 26:45-48) and (Qur’an 20:70) when the magicians prostrated; some started by saying they believe in the Lord of Musa first and then Harun second. Others when prostrating started by saying they believe in the Lord of Musa first and then Harun second. Scholars have given many other different views on why some mentioned Musa first and others mentioned Harun first but what we can agree is that these were two different statements from different groups of magicians. In Dajjal’s constitution, people have to vote for the presidential candidates from different political parties and the one with the most votes wins to rule with the same system of democratic manmade constitutions because they impressed the public more. In Fir’aun’s time, people had to watch the magicians and follow the group of magicians who won in terms of impressing them and since all of them promote Fir’aun then just like the voters who in the end, end up voting for the same democratic manmade constitution regardless; the watchers of the match regardless of which group of magician wins had to follow Fir’aun. If the presidential candidates tries to do anything out of the democratic manmade constitution such as implementing the pure Islam the democratic manmade constitution and the masses who are astray will support the of top members of Gog and Magog and try to put them down and call them liars, terrorists and such. Remember that the Quran always addresses the masses as being astray and since Satan (Iblis) knows this fact since he was talking with Allah after disobeying Him cleverly gives choice to the masses who are obviously astray and hence the few believers will never win in a democratic situation. This is similar to when Fir’aun had to say that the magicians and Musa conspired in the city to gain power and drive out the people. The chiefs who were representing Gog and Magog supported Fir’aun (which is in our times, Dajjal’s constitution) as can be seen in (Qur’an 7:123) after the magicians were ready to die as Muslims. Fir’aun’s people also had a role to play in supporting Fir’aun and his evil Chiefs via them being wrong-doers. Now to conclude all of this; we can move on to the next stage. We have to realize that Gog and Magog repeatedly exalt themselves and the Dajjal’s system as did Fir’aun. They also repeatedly ensure that people are divided. It doesn’t take a genius to realize that the Muslims have been divided into many different groups by many schemes. This can easily be exposed by the Hadiths of Prophet Muhammad (SAW). Where is Hijaz/Shams that are mentioned in the Hadiths nowadays? Have you ever asked yourself why some names have changed? Abdur Raheem Green: I think we Muslims are in a collective state of psychosis because we are proud to belong to country that was a map drawn by the non muslims 40, 50 years ago. How insane is that? Zindabad Pakistan. Pakistan is a country that was put there by the British. Maps drawn on the line, Egypt, Libya, Tunisia, Morocco; lines drawn on maps by the French, by the Italians, by the British, dividing us up into nations and now we are screaming, running behind some flag that didn’t even exist 100 years ago. Ready to fight for it and die for it. This is madness, this is sickness, this is something so far removed to what Allah revealed to Muhammad (SAW). It is nothing but another form of tribalism about which the Prophet Muhammad (SAW) said, “Whoever calls for tribalism and whoever fights for tribalism then they call and they fight and they die the death of Jahiliya (ignorance)”. Yet these are the lines upon which we are divided. Nationalistic lines, tribalistic lines, sectarian lines yet Allah warned us in the Quran many times about the dangers of dividing into sects and groups. Allah says in (Qur’an 6:159) to the Prophet Muhammad (SAW) as for those people who divide their deen into sects you have nothing to do with them in the least. Their reckoning is with Allah. And in the Quran Allah likened those people who divide the religion into sects and into groups, He likened them to the Mushriks and indeed it is one of the qualities, and sifwat and attributes of disbelievers. Psychosis: a severe mental disorder in which thought and emotions are so impaired that contact is lost with external reality. Next week we will learn more on how they divide us as we will try to present some solutions to unite the Muslim Ummah. The democratic manmade constitution has been glorified and exalted just like Fir’aun did of himself. It is presented as a good system just like how Fir’aun claimed as can be seen in (Qur’an 40:29) in private with the top Gog and Magog. To Fir’aun the most important thing was his religion to exist then he is worried about the so-called mischief that Musa would bring as we see in (Qur’an 40:26). In our case the most important thing for the Dajjal now is for the existence of democratic manmade constitutions then the so-called mischief Islam brings can be dealt with. Change religion means change power. The manmade constitution always claims there is no rule above it. Really? Not even Allah? The chiefs of Fir’aun were smart knowing they were speaking in front of the public and changed the wording around. They mentioned mischief first then changing religion which is changing Fir’aun second. Fir’aun and Dajjal are worried first about their power. The chiefs of Fir’aun representing the evil leaders of Gog and Magog now speaking to the masses know that the masses care more about mischief (they want their town and neighborhood safe) they care more about that than Fir’aun being a leader or not a leader. The masses/people of Fir’aun were fasiqun. The people who are befooled are the most dangerous Gog and Magog. Look at the image above again and tell us; if one of the dogs would try to attack the cat, would he be able to do it? Of course not; the other dogs who are befooled and pleased with being ruled by the cat would stop prevent the dog from attacking the cat. This is our scenario today; there are a very small people in the occult secret societies but nobody is willing to fight against these small numbers because they are surrounded by police and military who have been befooled and hence if you try to fight them then you are fighting with the befooled police and military. The befooled police and military of Gog and Magog. Since Allah is likening such disbelievers who see the signs but refuse to follow them then is it wrong to refer those who fit such categories as dogs and Allah knows best. The masses of Gog and Magog know Allah exists and are pleased to live without His Laws. Just like the dogs in the image above; they probably go to please the cat and are happy to get a pat on the head from the pleased cat. Really! Instead of pleasing Allah, they want the recognition of the cat. Isn’t this what the masses of the people are doing? After the magicians were defeated by Musa and they defied Fir’aun (Pharaoh) by deciding to follow Islam. Fir’aun (Pharaoh) then threatened and most likely killed the magicians. Notice that according to (Qur’an 10:83) above that they feared Fir’aun and his chiefs even though they were not even commanded to fight them. This simply equates to not daring to fight Fir’aun and his chiefs. This in our case simply means not daring to fight the democratic manmade constitution system of Dajjal and the top Gog and Magog’s secret societies. Ahmad Jibril: Many get cowardly in times like this, they don’t want to speak the truth, they don’t want to hear the truth, they don’t want to even practice the truth, some of them are so terrified today that they are even afraid to think the truth. That’s the peak of arrogance, to terrorize people so they can’t say a word. So they can suppress their thoughts. That’s the status we are in today. 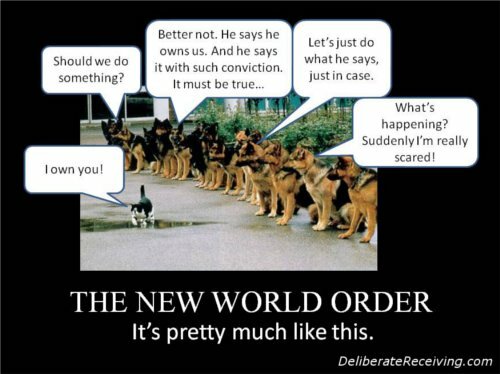 People nowadays know deep down that secret societies run the governments but they don’t even think about it because of fear. If you remind them; they shun you and call you a conspiracy theorist. Yes, it is because the existence of such cowardly people who call us conspiracy theorists that revelations have been given to Prophets to warn the believers about being controlled by secret societies that are able to exist and rule the many because of the existence of such cowardly people. We seek Allah’s refuge from being amongst the ignorant/foolish cowardly people. John F Kennedy was the 35th President of the United States from January 1961 (Gregorian) until his assassination on 22nd November 1963 (Gregorian). Ladies and gentlemen…. The very word “secrecy” is repugnant in a free and open society. And we are as a people, inherently and historically, opposed to secret societies, to secret oaths, and to secret proceedings. We decided long ago, that the dangers of excessive and unwarranted concealment of pertinent facts far outweigh the dangers which are cited to justify it. Even today, there is little value in opposing the thread of a closed society by imitating its arbitrary restrictions. Even today, there is little value in assuring the survival of our nation if our traditions do not survive with it. And there is very grave danger that an announced need for increased security will be seized upon by those anxious to expand its meaning to the very limits of official censorship and concealment. That I do not intend to permit to the extent that it’s in my control. And no official of my administration whether his rank is high or low, civilian or military, should interpret my words here tonight as an excuse to censor the news, to stifle dissent, to cover up our mistakes, or to withhold from the press or the public the facts they deserve to know. For we are opposed around the world by a monolithic and ruthless conspiracy that relies primarily on covert means for expanding its sphere of influence, on infiltration instead of invasion, on subversion instead of elections, on intimidation instead of free choice, on guerrillas by night instead of armies by day. It is a system which has conscripted vast human and material resources into the building of a tightly knit highly efficient machine that combines military, diplomatic, intelligence, economic, scientific and political operations. Its preparations are concealed, not published. It’s mistakes are buried, not headlined. Its dissenters are silenced, not praised. No expenditure is questioned, no rumor is printed, no secret is revealed. These tyrants always live in fear because of the crimes they have committed. They always try to solve the problem by wronging others and hence they accumulate wrongs and live in fear of losing power and hence they do more crime. Then they fear losing power and the cycle continues with the fact that they maintain their fear and doing sins just like Fir’aun and his Chiefs. We strongly advise Muslims not to vote for leaders who want to implement democratic manmade constitutions since we Muslims have to follow the Quran and Sunnah. 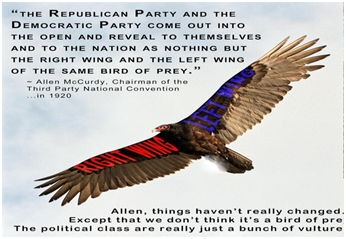 It is not right to vote for leaders who in the end, will end up implementing democratic manmade laws. They don’t force you to vote: http://zzpat.tripod.com/cvb/oct_2004/bush_god_speaks_through_me.html: A member of the group told Bush that since most Amish do not vote, they would pray for him instead. Bush had tears in his eyes when he replied, according to an Amish man who was present. Bush reportedly said he needs the prayers of the Amish and that having a strong belief in God is the only way he can do his job. A point to note before proceeding is yes, we should pray to Allah to guide the disbelievers and not to pray for their system of democratic manmade constitution to prosper. If you are shown a lion, a cat, a leopard and a vulture and you are asked which one is the odd one. You would say a vulture because it is a bird while the others are from the cat family. Do you want to risk on the Day of Judgement to be similar to Gog and Magog in the most distinguishing feature to them which is voting for democratic manmade constitutions? Sometimes you really might be forced to choose between the lesser of two evils; just like in Surah Kahf when the boat was destroyed and the boy was killed by Khidr in front of Musa to achieve a greater good; and he did all these acts because he was instructed to do them by Allah. Sometimes you have to act in the same manner Ibrahim acted in (Qur’an 6:74-83) to bring people closer to Islam. In the end Ibrahim told them the truth of Islam. The above verse (Qur’an 16:106) has been used by critics that Muslims are allowed to lie in all circumstances. Before we move forward on whether the verse gives approval of such, let’s first look at the verses in its historical context, why it was revealed. The early Muslim community suffered many persecutions at the hands of disbelievers in Makkah. Those who did not have strong ties with family were more vulnerable to get tortured by the disbelievers. In many of these instances, many Muslims lost their lives for believing in One God and His final Messenger i.e., Islam. The verse under discussion was revealed because some Muslims (Companions of Prophet Muhammad (p)) were tortured and uttered disbelief so that the persecutors stopped tormenting them. Although they uttered the words, they still believed in Islam, and merely said it so the persecution stops. Hence, the Quran states that those who had done such, there is no blame on them for what they did, and said these things when they were in a situation where it meant either to live and continually be under torture or be put to death. So, there was no sin on those who said things which were contrary to what they believed in their heart. Moreover, the claim by critics that the verse sanctions Muslims to lie to disbelievers in ‘all circumstances’ is false. All commentaries agree that only in such situations were one is tortured is one allowed to say things which are not true. Are Muslim lands also controlled by Gog and Magog? Before we answer the question. How about we contemplate? If Muslims were really united; why don’t all the so-called Muslim nations unite and go help the Palestinians in Palestine (now called Israel). We did a sample check of many Muslim lands and sadly they had the element of democracy in their constitutions. The most important fact to take note of is that no Muslim land can be considered a superpower. Muslims lands nowadays are either with America or Russia. Are these superpower nations really against each other as enemies as the media portrays them to be or are they just playing with our minds to do what they are planning to do. Remember that we live in very confusing times. Regardless of their true intention; we do know that everyone will follow the Dajjal when he comes out in person except the true believers who will later be joined by ‘Iesa (Jesus). Remember the one eye in the ‘Declaration of the Rights of Man (1792)’ belongs to the Dajjal and is about the implementation of democratic manmade constitutions and democracy. If a country/nation has these elements then think twice and beware. Even if a nation claims they don’t like the democracy system but are still in it simply proves Gog and Magog have fully controlled them and they can’t get out. The suspicious are the powerful nations who can reject this democracy system but still choose to apply it. Out of all Muslim lands why are focusing on Saudi Arabia? It is because within it there is Mecca and Madina. Mecca and Madina are special because Prophet Muhammad (SAW) specifically mentioned that the Dajjal will not be able to enter these places in person. But before we proceed; we need to get some things straight. Hijaz is now called Saudi Arabia which is not good. Just like how Al-Andalus is now called Spain. Changing the original names to fake names is a very wicked practice done by Gog and Magog. In the 1960s the SAWT AL ARAB Broadcasting Station in Cairo, Egypt, and the YEMENI Broadcasting Station in SANAA confirmed the Jewish Ancestry of the SAUDI Family. “WE, THE SAUDI FAMILY, are the cousins of the Jews, we entirely disagree with any Arab or Muslim Authority which shows any antagonism to the Jews; but we must live together with them in peace. Our country (ARABIA) is the Fountain head from where the first Jew sprang, and his descendants spread out all over the world. 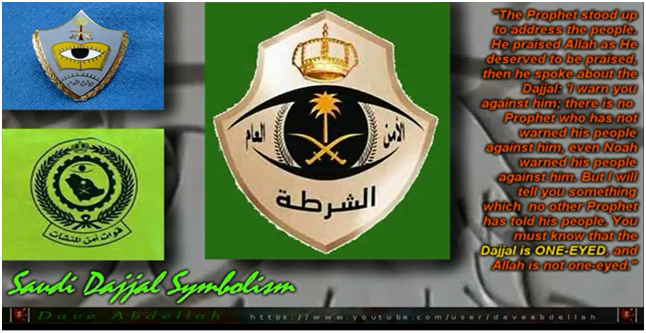 The image above shows that the Dajjal is in Mecca and Medina via the Saudi Regime. Our Prophet (SAW) did see the Dajjal as being blind in one eye in his dream performing Tawaf around the Ka’ba while placing his hands on the shoulders of a person meaning that he will reach Mecca and Madina via using Gog and Magog but he himself will not be able to enter when he comes in person. The fact that ‘Iesa is also making Tawaf around the Ka’ba seems to indicate that the Dajjal is extremely limited to do what he wants in Saudi Arabia. It is true that America controls the Saudi family but they are also constricted by the constitution of Saudi when it states that constitution is the Qur’an and Sunnah. The Dajjal who fears ‘Iesa can’t do much when ‘Iesa is around. We know that when the Dajjal comes out and when ‘Iesa comes out; they won’t be making Tawaf so this dream is tahaweel that Dajjal won’t literally enter Mecca and Madina but his system will somehow reach them via the Saudi regime. But as we stated above; the kingship model that replaces the Caliphate is a bogus system. And it is this corruption that is the max Dajjal could do. It should be noted that the Dajjal is very difficult to understand. To understand the hadith above, we need to briefly consider the concept of the ‘occult’. Occult literally means hidden. The dajjal, although exerting the most powerful influence, will hide his true characteristics from plain view. The colossal enterprise accompanying the dajjal would be hidden and so as his worship. The ancient Egyptians assigned Horus the name: ‘Hoor Par Kraat’ which translates into the ‘hidden god’. Another name assigned to Horus was ‘Amon-Horus’ which also means the ‘hidden god’. Who is this ‘hidden god’ which prominent occult societies such as Freemasonry, Rosicrucianism and the Theosophical Society pledge allegiance to? To examine this further, we look at some of the monograms employed by these occult societies as detailed in figures 31, 32 and 33 below. The reader should know that almost all occult societies employ the monogram of the Eye of Horus. This suggests that such occult societies pledge supreme allegiance to the figure of Horus who is their ‘hidden god’. Again, the roots of occult societies lay in the Renaissance with the formal formation of Rosicrucianism in the early 1600s and that of Freemasonry in the early 1700s. Although the founding of the Theosophical Society occurred later in the 1800s, the concept of modern theosophy had its origin in the 1500s. The Renaissance represented that period of time when these occult societies were formed and thrived in earnest, thereby institutionalizing the worship of Horus, their ‘hidden god’. The Saudi Family members know perfectly well the Muslims all over the world have already known their real Jewish Origin. Muslims have now known all their bloody past, which was, and still is stuck in the same mire of Brutal Despotism and Atrocity. Presently, they exert their utmost efforts to conceal their Jewish Origin by covering themselves with the cloak of the Islamic Religion, so as to try to keep their real Jewish Ancestry hidden in the dark by connecting their family tree with our Holy Prophet Muhammad (PBUH). Anyone who is iniquitous and blasphemous cannot affiliate him/her self to our great Prophet Muhammad (PBUH) even though he/she may be the closest blood relative to him. Bilal, the Abyssinian slave, who was a faithful Muslim, was much more honored by Islam than Abu Lahab, the pagan, who was the real blood uncle of our Prophet. In Islam there is no Favoritism. Allah sets the degree of comparison in Islam according to the person’s piety and not according to his/her worldly status of affiliation to any dynasty. IARLG’s comments: If we read (Qur’an 7:11); it clearly shows that Satan (Iblis) and the angels were commanded to prostrate to all of us who were at that time within Adam. Why do we say this; because the wordings, “created you” “gave you shape” are all addressing more than two using the Arabic word “kum” to indicate that the angels also prostrated to us too. This point is further proved when we look at (Qur’an 7:172) which shows all of us were brought out from the loins of our father Adam. This means any of us as long as we qualify can be a Khalifa. It doesn’t matter if you are an Arab, Jew, Black, White etc any of them can be a Khalifa as long as we good Muslims. IARLG’s comments: Lastly is that we are living in very confusing times. We asked ourselves why don’t the Muslims of Hijaz just remove the Saudi family by force but we found that it is not that easy. The system of government in Saudi Arabia shall be monarchical. The dynasty right shall be confined to the sons of the Founder, King Abdul Aziz bin Abdul Rahman Al Saud (Ibn Saud), and the sons of sons. The most eligible among them shall be invited, through the process of “bai’ah”, to rule in accordance with the Book of God and the Prophet’s Sunnah. The King names the Crown Prince and may relieve him of his duties by Royal Order. The Crown Prince shall devote full time to his office and to any other duties which may be assigned to him by the King. The Crown Prince shall assume the powers of the king on the latter’s death pending the outcome of the “bai’ah”. Citizens shall pledge allegiance to the King on the basis of the Book of God and the Prophet’s Sunnah, as well as on the principle of “hearing is obeying” both in prosperity and adversity, in situations pleasant and unpleasant. The regime derives its power from the Holy Qur’an and the Prophet’s Sunnah which rule over this and all other State Laws. The system of government in the Kingdom of Saudi Arabia is established on the foundation of justice, “Shoura” and equality in compliance with the Islamic Shari’ah (the revealed law of Islam). Or maybe Prophet Muhammad (SAW) knew this would happen and hence this is a stage we must go through as Muslims as per the hadith below as we wait for the coercive rule/period. We do know that there are Muslims in Hijaz who tried and are trying to overthrow the Saudi family but are kept captured and kept locked in prison. We only mention the Muslims in Hijaz because the Saudi family in the constitution has stated that they accept the pledge of allegiance of the citizens only and not all Muslims which is kind of problematic. So it is a legal obligation, from the above-mentioned evident proofs (from the Quran and the Prophet’s statement), that there shall not be more than one Khalifah (a chief Muslim ruler) for the whole Muslim world or otherwise there will be a great Fitnah (mischief and evil) amongst the Muslims, the ultimate results of which will not be worthy of praise. Please keep in mind that Gog and Magog are in control via many other ways, some of which we have explored such as by the use of magicians and similar methods. Other methods include the instilling of distractions (eg how Fir’aun used Qarun and the magicians) and control of major if not all economics and financials mainly through gold. Others include the control of the media and entertainment. They allow the minds of the people to be filled with filth. Fir’aun promoting the magicians equals him promoting filth since magicians do all dirty things to do their magic; the top Gog and Magog use musicians who are in reality magicians through their music to promote filth and the Dajjal/Satan in their works. It is very difficult to go through all of these and more individually since all elements of control are kind of hidden and not so noticeable though they are evil. What is the most dangerous thing? To die in a state of shirk! That is why this article primarily focused on the foundation of shirk that is so hidden. Once you understand this you will In Shaa Allah realize the other evils they use to protect this evil foundation of shirk. Light helps/enables us to see the truth. We can’t see in darkness, right? The Quran is light and through it’s light one can easily realize the evils surrounding us. For example not many of you might know it but you know Fir’aun used to hold festivals to entertain people; why was he doing that? It was mainly to distract them from the more important things in life and to keep them ignorant. Do you know that the top leaders of Gog and Magog have done something similar to us? Football games, soccer games, wrestling and the like. Ever wondered why they get paid high wages? Understand that these sports exist to keep us distracted. They even sometimes or most of the times plan the results of the match ahead of time and the players have to act on it. Nowadays with sports betting available they get distract the dazzled public even more. Another example is in (Qur’an 43:53) where Fir’aun indirectly claims that he has gold while Musa didn’t have gold. This shows that Fir’aun viewed gold as important and valuable which is okay since (Qur’an 3:14) states gold and silver is beautified for men. The real issue is why don’t we view gold and silver as valuable? There are many Ayat in the Quran which indicate people using gold and silver coins for trade but we in our current modern times are using papers or some form of electronic pulse as money. Keep in mind that Gog and Magog are also people and so (Qur’an 3:14) applies to them too. Why are the top Gog and Magog keeping the gold reserves and why are we using paper as money? How much amount of gold are we even allowed to use for trade? You got ask yourselves these kinds of questions and try to find answers and solutions. Another form of evil implemented is teaching/preaching of falsehood just like Fir’aun when he preached falsehood. Children are taught in school that we came from monkeys and recognizable Islamic universities teach partial Islam such as you can’t mix religion with politics and that Gog and Magog are little creatures that have yet to be released. If any teacher tries to teach the true Islamic Tawheed with all its elements then that teacher is shunned and removed. Another example which you can easily realize the evils through the Qur’an is that of secularism. In (Qur’an 11:87) Shuaib is told by the Chiefs not to mix religion and business while we know Islam covers all aspects of our life. We know we can learn a lot of evils from Fir’aun and his people via the Quran but please don’t forget about the rest of the Ayats of the Qur’an.